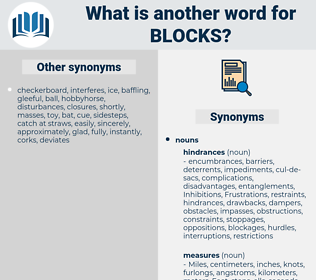 What is another word for blocks? blocs, Areas, locks, impediments, objects. 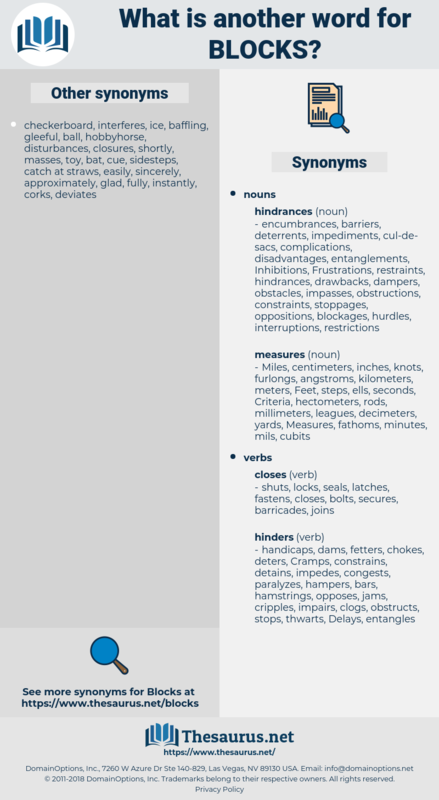 impede, factors, lock, locks, constraints, prohibits, component, components, considerations, challenges, barrier, barriers, disappoints, packs, rejected, dimensions, elements, ensembles, hamper, particulars, opposes, blade, blades, objects, dismisses, ingredients, restraint, reject, rejects, pillars, material, rebuffs, stalls, refuse, refuses, shut, points, declines, protests, BMRC, shuts, parts, features, aspects, end, arrests, ddr3, stays. bottlenecks, deadlocks, barracks, cobbles, setbacks, Neighborhoods, docks, obstructs, complexes, corners, subdivisions, neighbourhoods, combinations, checkboxes, Constituencies, conglomerates, limitations, rocks, chocks, lock-ups, headquarters, accommodations, checks, compartments, lock-outs, check-boxes, Inhibitions, cracks, checkpoints, chambers, locations, precludes, quarters, underpinnings, colleges, constituents, sledgehammers, blanks, deliverables, subdistricts, barricades, collections, lockups, immovables, apartments, compilations, reservations, inhibits, WINDOWS, bucks, clubs, sub-districts, sticks, withholds, attributes, coalitions, localities, kilometres, columns, contingents, hindrances, boulders, things, reservoirs, stereotypes, cubes, IMMEUBLES, scruples, landmarks, consignments, standstills, fondements, essentials, moulds, Cells, fundamentals, factions, pavilions, segment, segments, boroughs, Tracks, problems, Floors, platforms, intervals, impedes, clutches, Keys, compounds, brackets, portions, subsections, occasions, divisions, fragments, submissions, pockets, services, thumbscrews, disorders, rooms, dwellings, withheld, allotments, materials, condos, lessons, fundamental, walls, grassroots, clots, designates, closings, boards, flats, slots, milestones, lodge, closures, dollars, arrangements, groupings, basic, marbles, townships, hurdles, breaks, Selections, screens, developments, shields, Towers, fascicles, homes, suburbs, opponents, increments, districts, details, benchmarks, Tablets, Foundations, syndicates, tables, mammograms, Categories, sectors, everywhere, baselines, bottoms, pools, Embargoes, documents, topics, logging, occupants, holdings, wards, Classes, Boundaries, handicaps, FORMATS, scopes, latches, parcels, Branches, tokens, lots, vouchers, Databases, reactors, tutorials, Facilities, quadrats, fields, Stations, cliches, squares, diamonds, tiles, proportions, matters, Artifacts, seals, tranches, Coins, cartels, hangs, stretches, controls, photographs, settlements, winnings, Shelves, Properties, bones, baskets, settlers, Incentives, fasteners, loads, periods, purchases, layers, piles, headings, numbers, volumes, instalments, datasets, parameters, alliances, basics, shutdowns, markers, temples, poles, inserts, booms, batons, beamlines, strips, defects, Accessories, times, Lions, monitors, residents, homeowners, Drives, Templates, domains, TACOS, outposts, mainstays, frames, footings, stripes, panels, marches, plots, Piers, vessels, departments, inspections, grantors, slices, retained, relics, nachos, roots, roads, bits, parks, FACETS, soles, bullets, packets, snapshots, Staves, batches, gangs, GRIDS, prior, cays, rigidities, edges, suites, bundles, estates, shipments, impasses, plantings, swathes, grounds, Currencies, sites, spaces, tracts, favours, gemstones, strands, chunks, owners, exhibits, grandes, shutters, Quantities, droves, passages, Slums, displays, groups, seats, spheres, shoes, Angles, Benches, zones, Patches, islets, HOS, inputs, bilges, positions, chapters, streams, pounds, wedges, ends, Footpaths, pauses, series, huts, tiers, remnants, Entities, pierres, bumps, Phases, barrages, annexes, CAMPS, flanges, spots, flags, Weights, pictures, filaments, OARS, dykes, spells, before, basis, Industries, snags, clasps, lands, SHIMS, sides, kits, regions, jewels, jams, Forms, nutrients, little, bills, earths, PODS, dams, Bodies, Entries, Plants, plates, places, wands, apples, pads, keeps, scans, Gems, beams, stages, tents, weirs, VOTES, tenants, flaps, exposures, tags, subjects, Films, visors, ranks, venues, shards, peaks, Photos, data, heads, arrays, teams, facts, Ones, SPARES, Cues, PIES, themes, farms, bats, shares, dots, shifts, troops, rounds, ranges, tenets, merits, crashes, yuan, amounts, drivers, vents, courts, sums, Shots, Stories, releases, Rewards, near, grand, degree, degrees, few, bands, posts, Ships, images, prizes, trains, TAPES, masses, Plays, pans, Rames, cuts, stands, large, Parties, staffs, figures, factors, Guns, constraints, runs, component, components, considerations, challenges, barriers, LINEs, base, Bases, packs, Cas, dimensions, elements, ensembles, particulars, blades, ingredients, pillars, material, stalls, points, parts, features, aspects, arrests. antagonizes, freezes, coordinates, inhibits, impedes, puts, crashes, packs. BRICKS, cornerstones, premises, streets, Stones. Mr. Ellsler was ill, for the first time since I had known him, and I had been over to his home, three or four blocks away, and bade good - by to Mrs. Ellsler and gentle little Annie - the other children were out. These" - pointing to the blocks -" are so pretty.